These adorable bear coasters would be such a delightful and enchanting addition to any home at Christmas. Their dual purpose of beauty and serviceability make them uniquely desirable. Plus, they would brighten up any table this Christmas! This Bear Coaster Set is a plastic canvas kit that includes everything you need to make 6 Santa Bear coasters and the caddy. Well, everything except the scissors. While it is not required to make the coasters, I would recommend backing your finished coasters with felt to help protect wood furniture. Felt is optional and is not included in the kit. 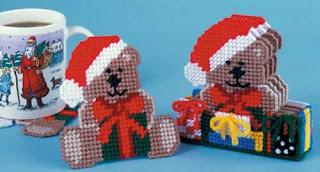 Plastic Canvas is such an easy, fun and quickly rewarding craft and these bears would make a really sweet Christmas gift to give to anyone on your Christmas list. However, I suspect you will be tempted to keep them yourself. NOTE: I'm sorry, but this item is currently sold out! Please visit the House of Sylvestermouse eBayStore to View Available Plastic Canvas Kits.